LAKEVILLE, Conn. – Ford Chip Ganassi Racing played the rare role of spoiler Saturday in the Northeast Grand Prix at Lime Rock Park. With Corvette Racing eyeing an historic 100th career IMSA win following what had been a dominant weekend for the team, the No. 66 Ford GT of Joey Hand slowly caught and eventually passed the No. 3 Corvette C7.R of race leader Jan Magnussen with 13 minutes remaining, driving away to an 11.431 second victory alongside co-driver Dirk Mueller. The winning pass came when Magnussen tried to make a move on a GT Daytona car in turn seven. Magnussen cleared the car but ran wide, allowing Hand to slip by. It was a surprising turn of events as Magnussen and co-driver Antonio Garcia were strong all weekend, starting on the pole and combining to lead 150 of the race’s 178 laps. “I think today we capitalized on some opportunities, some guys made mistakes and we were right there to take advantage of it,” said Hand. “Winning races is all about that, winning championships is all about winning races. “I hope everybody enjoyed the race today. This is one of those places where you get that feeling, you have such genuine fans here. You can see them on the hillside, it’s like a stadium race. It’s like a short track Saturday night. I think that’s what makes this WeatherTech series a show, and it has to be a show. That’s why we’re all paid to be here. I’ll tell you, when I get to race in the show and I get to win, that’s what makes it worth it. It was the third consecutive IMSA WeatherTech SportsCar Championship GTLM win for Ford Chip Ganassi Racing with Hand and Mueller winning two races ago at Watkins Glen, and the No. 67 Ford GT of Richard Westbrook and Ryan Briscoe winning the most recent race at Canadian Tire Motorsport Park. 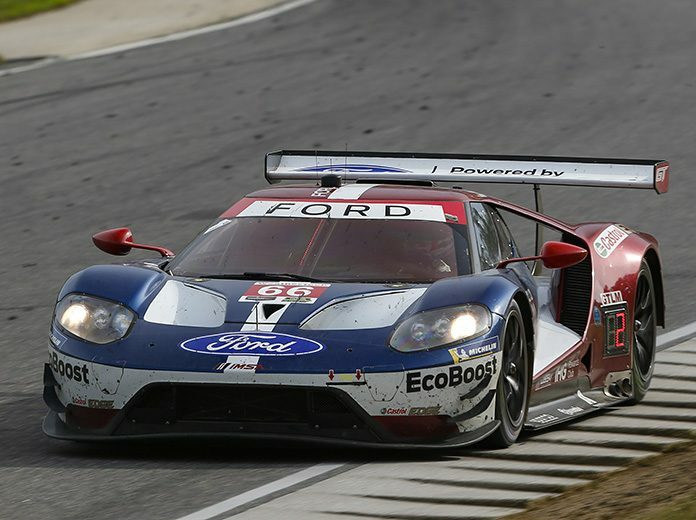 Both Ford GTs are now in the thick of a tight points battle with Corvette Racing with four races remaining. Mueller and Hand unofficially now have 208 points with Garcia and Magnussen a point behind with 207 and Briscoe and Westbrook one point further back with 206.